VMware vSphere 4.x was released for general availability nearly two years ago and now vSphere 5.x is rumored for release later this year. In June 2009, virtualization master Scott Lowe wrote a blog post illustrating the roughly 16 manual steps to upgrade virtual machines to VMxNet3 adapters and Paravirtual SCSI (PVSCSI) controllers. Interestingly, two years following I still encounter larger environments that are not fully taking advantage of the performance characteristics of these two virtual machine hardware types. The reason is simple, this 16 step process can take up to 30 minutes of downtime per virtual machine if done manually, not to mention the inevitable human error. Unfortunately, what I have most frequently heard is that the time required to manually perform these virtual machine modifications enterprise-wide does not outweigh the advantages of utilizing VMxNet3 Adapters and PVSCSI Controllers. Instead, most larger environments update and implement these enhancements in their VM templates, but leave all other vSphere migrated/legacy virtual machines configured with either Flexible/E1000 NICs and/or LSI Logic Parallel SCSI/SAS Controllers. What if we could change all that? What if this entire process could be automated, requiring less than 5 minutes of downtime for each virtual machine? What if we could cycle through all virtual machines in a given vCenter instance and automatically perform these modifications to all virtual machines? Two years after its release VMware certainly has not demonstrated an “Update Manager” migration approach for VMxNet3 and PVSCSI. Other scripts have attempted this in the past, but typically miss the bar when it comes to the Guest Operating System configuration. Most data center virtual machines have Static IP Addresses configured on the Virtual Machines and quite frankly, this can be a chore to remove and add network adapters, ensuring the correct settings are reconfigured for the new adapters. – Only execute against virtual machines with static IP addresses configured. The current revision does not programatically determine if the NIC is set to DHCP and assumes all VMs have Static IP addresses. I intend to change this in future releases. – Only execute against virtual machines with single NIC configurations and single SCSI controllers. The current revision does not address multi-homed systems or multiple SCSI controller configurations. – Only execute against virtual machines with up-to-date VMware tools. Other scriptsare available to update VMware Tools using PowerCLI without a reboot. Outdated machines will be bypassed. – Only execute locally from the virtual center server. For simplicity, in Revision 1 I intend for the script to be executed from the vCenter server locally. Therefore, the above components must be installed on the server locally. – Test the script against test/dev VMs using the “comma-seperated virtual machines” option prior to running against “*” for all virtual machines within vCenter. – DevCon.exe included in the zip file or available from http://support.microsoft.com/kb/311272. Devcon.exe for i386 must be placed in the same directory as the script. – NVSPBind.exe included in this post or available from http://archive.msdn.microsoft.com/nvspbind. NVSPBind.exe for XP (Most stable for all operating systems and forward compatible) must be placed in the same directory as the script. – Authentication credentials for the Guest Operating System of all virtual machines. Credentials will be requested once and used throughout the process for subsequent virtual machines. To execute, simply unzip all files and right click the Ps1 script and select “Run with PowerShell”. Do not execute from an existing PowerShell or PowerCLI instance. All necessary components will load automatically when you select Run with PowerShell. Please feel free to leave a comment if you have any special requests or would like to leave feedback on results in your environment! Now that I have the framework fully laid out, I fully intend to utilize these processes to enable automated upgrades to components available in the new release of vSphere 5. Check back often for new revisions and updates on this script. All other operating system versions will report “Bypassing legacy or non-Windows virtual machine”. Additionally, I have added functionality to support Devcon hidden device removal for 64-bit Operating Systems. Devcon64.exe is now included in the attached Zip file (Obtained from the Windows Driver Kit using the procedures documented here). The attached Zip file also includes an updated version of Devcon.exe for 32-bit systems (6.1.7600). Looks like this may work on a script I was trying to build. I have a VDI cluster that all I’d like to do is change the boot disk to PVSCSI. NIC’s use DHCP and VMXNET3 NIC’s are installed. Would it be possible or easily changed to just migrate to PVSCSI? 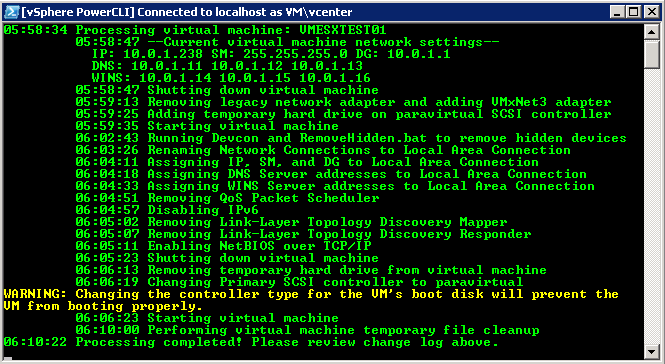 My environment consists of VM’s with two NIC’s. Any idea or suggestions on how to make this script work with dual NIC’s VM.